Watch an excerpt from “Jackie Robinson: a Man Apart,” a one-man show by Mike Wiley ’04 (MFA). They elbow one another for space in his mind: young black teenagers and their worried mothers, old white supremacists and their nervous wives, skeptical lawyers, gravelly voiced journalists and a slave who mailed himself to freedom inside a box. Mike Wiley ’04 (MFA) not only plays them all on stage — often more than two dozen characters in a single performance, with no costume changes and few props — the documentary theater actor and playwright rehearses himself to sleep at night with their dialogue, their humanity and inhumanity strumming through his head. Wiley has been talking to himself — and more importantly, to school and regional theater audiences across North Carolina and throughout the U.S. and Canada — for almost two decades as a solo artist, bringing to life some of the most painful moments in American history. 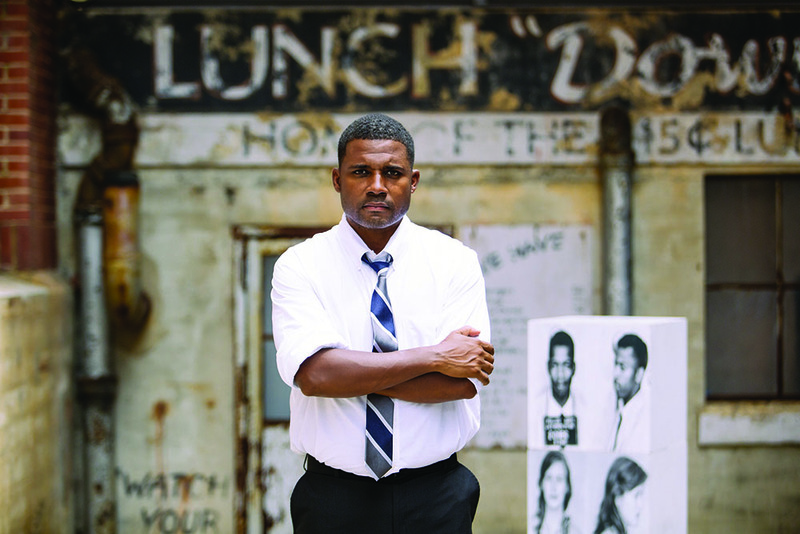 From the lynching of 14-year-old Emmett Till in 1955 Mississippi to the Freedom Riders’ courage in the South in 1961, his nine touring plays find an ever-relatable place for African-Americans’ past in the diverse audiences of the present. Hark the Sounds podcast: Mike Wiley talks about his career, using humor in his performances, and how badly his car needs to be cleaned. In April, the playwright will leave the acting to others for his newest work, Leaving Eden — his fourth career ensemble piece, debuting as PlayMakers Repertory Company’s first fully commissioned play. The production might not have Wiley’s dynamic stage presence, but it does have his agile mind written all over it, that humanity and inhumanity he knows so well. The result is a story about the leaders of a small North Carolina town “trying to push migrants out,” not realizing that the work and skills they provide are the lifeblood of the town’s economy, Wiley said. Wiley is ever-mindful of history’s echoes. He lived inside them as a kid growing up in Roanoke, Va., in a region of the country that once defunded its entire public school system for five years rather than comply with integration. By the time Wiley was in elementary school, he was bused with other African-American students 45 minutes to a white neighborhood. Wiley found his moments onstage, beginning with his role as Abe Lincoln in a sixth-grade school play. That creative casting emboldened him with a sense of freedom, and he began to ride the city bus to Roanoke’s regional Mill Mountain Theatre regularly in middle school, auditioning for every open part that came along — boy or girl, black or white. Though he tried to cure his theater bug while at Catawba College in the 1990s, where he aimed for a career in radio or television instead, he eventually gave in to it full-time, getting an MFA in acting from UNC and launching Mike Wiley Productions. Teachers from all backgrounds approach Wiley with gratitude for his performances, which mix humor and drama; they say that, through his presence and his storytelling, he’s helping combat intolerance in a younger generation increasingly exposed to extremist views. Wiley’s work sometimes faces opposition, displaying the raw truth of the lessons it contains. In 2007, a venue changed the time of a performance in Mississippi due to death threats. In Oxford, N.C., organizers assigned Wiley bodyguards while in town for his adaptation of Blood Done Sign My Name, Tim Tyson’s book about the 1970 murder of an African-American in that town and its roiling aftermath. Sometimes, audience members will shout racist remarks during his plays — moments Wiley has learned to address in character, incorporating the epithet into the show’s narrative as a teachable moment. There’s poetry in that maneuver, just as there’s poetry in Wiley assigning audience members of all ages roles during his plays. For Wiley, the best way to understand history is simply to live it — no matter how crowded its cast list gets. Cake and Conversation: As writer Bekah Brunstetter ’04 shows throughout her funny and moving play, The Cake, reconciling traditional roots with progressive values in a polarized world is wrenching work.